Ecommerce is the new frontier for modern businesses and provides entrepreneurs with an easy to use platform on which they can use to take their operations online. Whatever the kind of business you run, an eCommerce store will help you target a larger market base and provide your customers with better services. To build the best online store, you need a versatile eCommerce platform. Magento eCommerce has emerged as the eCommerce platform of choice for businesses seeking to create robust online stores. This article explores the advantages of Magento development for high performance online stores. In the 10 years since Roy Rubin and Yoav Kutner created the open source platform named the Magento Community Edition, it has grown into a powerful tool. Over the span of its existence, this eCommerce platform had received financial backing from eBay as a part owner, before its acquisition by Adobe in 2018. Today, over 240,000 merchants worldwide trust Magento for their online operations and it has become the most preferred platform for eCommerce developers. What makes Magento E-commerce Tick? Every business has unique needs. This makes it important to choose an eCommerce platform that allows for easy customization. As a business owner, you want your eCommerce store to reflect your brand in all aspects. This necessitates the needs for multiple customization options. Magento comes with multiple CSS customization options ready for use in your web design. Business owners can now build eCommerce stores that reflect their brands by leveraging customization options available on Magento. Most shoppers today use their smartphones to make purchases. Business owners who look to build modern eCommerce stores need to consider this while planning their online stores. Magento keeps up with mobile web design standards and comes loaded with tons of SEO friendly features. The idea is to make your eCommerce store friendly to mobile users, while boosting your ranking on search engine result pages (SERPs). Mobile visitors enjoy a remarkable experience when they land on an online store built on the Magento platform. The mobile friendly features help increase sales conversion and boosts customer loyalty as well. Magento stays up to date with the latest SEO ranking factors to guarantee that your eCommerce store ranks high for keywords that you target. Better still, the platform provides multiple meta-implementation options and a great URL structure, a must have for proper SEO. New challenges will emerge as your online business grows. These would include the need for better security and speed among other things. You have to accommodate such changes on your eCommerce website to provide your customers with the best experience. Magento offers extensions to increase functionality and keep your business going. You can cope with emerging challenges using these extensions to provide a seamless user experience at your eCommerce store. For any online business to survive, speed is a major consideration. Slow loading pages lead to loss of business and a poor reputation. Magento offers solutions for growing businesses by ensuring fast loading pages through lower HTTP requests. The faster page loading speeds reduce bounce rates and increase conversions. This is one of the main reasons why Magento is in high demand. You need all the help you can get when you are building an online business. Many business owners make fatal decisions in the initial stages of eCommerce development due to lack of information. When you join the Magento community, you have an extensive resource base, which you can leverage to grow your business. In the Magento ecosystem, business owners learn a lot from developers and they use such knowledge to improve capabilities of their online stores. When looking for an eCommerce platform for your online store, you should focus on features that will give you an edge over competition. Choosing to use Magento provides you with built-in eCommerce boosting features such as product bundling, dashboard, customer segmentation, multi-lingual support, inventory management, and promotional pricing. This open source platform is custom-built for eCommerce, making it an ideal choice for online businesses. At your eCommerce store, you expect to target all kinds of customers and as such, you should provide them with multiple payment options. One major reason for cart abandonment is the lack of flexible payment methods. You can overcome this problem by using Magento. You can use multiple payment options at your eCommerce store to reduce cart abandonment and increase sales conversion. It is possible to handle multiple websites on your Magento eCommerce platform without any hassles. For an administrator, being able to handle multiple stores from one control panel is a great advantage as it saves time and money. Magento provides the necessary tools that allow you to do this, thus making it the preferred eCommerce CMS platform for business owners having multiple websites. 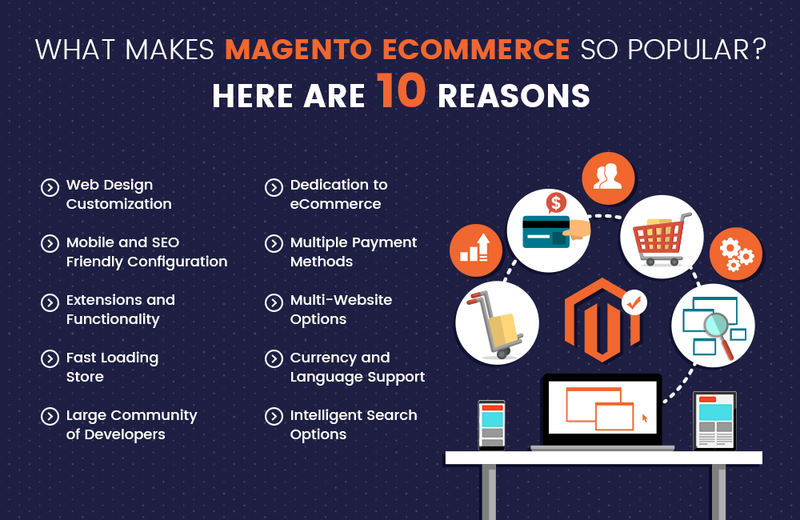 Magento is one of the most versatile eCommerce platforms when it comes to currency and language support. It dynamically supports multiple languages and currencies around the world. You can now boost business revenues by targeting any markets with your Magento store. To reduce bounce rates and increase conversion, you must provide a seamless user experience on your eCommerce website. When you use Magento, you will get an intelligent filtered search that makes things easier for shoppers. Shoppers will enjoy a better experience when they are able to use unique search terms, view product reviews and get a list of auto suggestions among other features. When choosing an eCommerce development company, it is important to ask them about their expertise in Magento eCommerce development. This eCommerce platform offers a wide range of benefits suitable for any growing business. You can now save yourself the hassle of having to rebuild your eCommerce website from scratch as your business grows because Magento offers versatile extensions to increase functionality. Using the multiple customization options Magento provides, it is now possible to build your brand online and the advanced SEO features, provide you an edge over your competition.